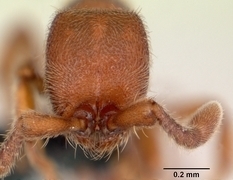 This is Cerapachys biroi, a small reddish-brown ant native to eastern Asia and the Hawaiian islands. It is completely blind, but that doesn't stop it from displaying some very interesting cognitive behavior. You see, these ants learn from experience. The common view of ants is that they are mindless machines, completely preprogrammed automatons. As a super-organism, an ant colony is viewed in the same light as the human brain, but individuals are dismissed as incapable of real intelligence. However, a study done on these ants may change that view. C. biroi was chosen for this study because each new generation of workers is produced all at once, so all the fresh workers have the same level of experience. What the scientists did was to split this new group in half. Members of one half were rewarded with prey items every time they foraged, whereas the other group was forced to come home empty handed. After thirty days, the successful group continued to forage every day, but the other group had all given up and switched jobs. They now spent their time caring for the young within the colony. Do you see how amazing this is? The ants who failed at foraging realized they weren't any good at it, and so took up a position within the colony that gave them more positive feedback. In my mind, this elevates ants forever from the realm of simple machines and into the realm of living, thinking beings. Truly, the wonders of the natural world never cease to amaze me. SUPERB.CAN AN ANT FEEL VIBRATIONS IN EARTH ?